Choose from three investment options invested in a single Vanguard LifeStrategy asset allocation fund. These three portfolios give you the opportunity to invest based on your desired risk tolerance and investment goals. 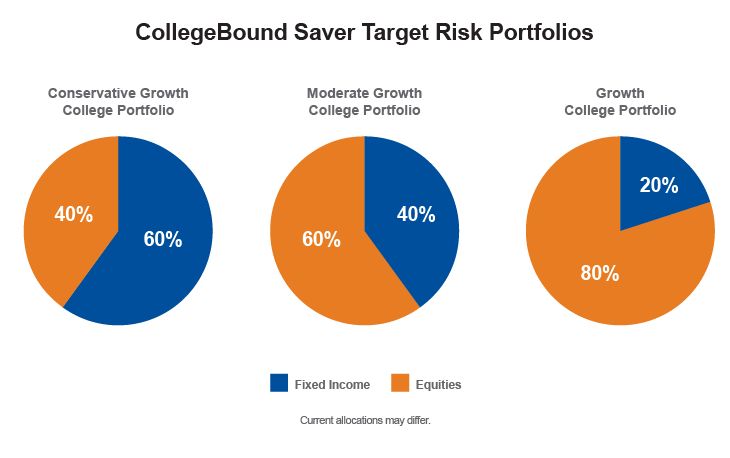 Unlike the Age-Based Portfolios, if you invest in one or more Target Risk Portfolios, your assets will not be automatically moved to more conservative investments as the Beneﬁciary ages. Instead, your investment will remain fixed in the Portfolio unless and until you direct us to exchange into another Portfolio. Each Target Risk Portfolio invests in a single Vanguard LifeStrategy Fund with a preset asset allocation strategy which provides Account Owners with a simple way to meet typical investment needs at different stages of life. Each portfolio invests in a single Vanguard LifeStrategy Fund with a preset asset allocation of equities and fixed income. For more information on each Target Risk Portfolio, visit each portfolio's details page found on the Portfolio Price and Performance page.